So I’m back from an awesome long weekend of fishing north of the city. Feels great to have some time to unwind and relax. Glad to see Tony wasn’t a total slacker while I was away! 😀 Nothing beats enjoying cigars in the middle of a calm lake under awesome weather and catching some tasty fish! Was hard to get back to work this week but Tony chained me back to my desk and put me right back to work! I’m pretty sure everyone has heard us and other blogs jabber on about La Aurora. They’ve been turning out some fantastic cigars as of late so I can’t really blame all the great press they’ve been getting. Also worth mentioning, Guillermo Leon recently bought out La Aurora and is now running the successful ship! He’s not shy to turning out quality smokes as you can see in our review of the fairly new Guillermo Leon Signature Cigar. I decided to pick up a La Aurora cigar but instead of one of their fancy new blends, I went with one of their blends that’s been a staple on their profile for awhile now. 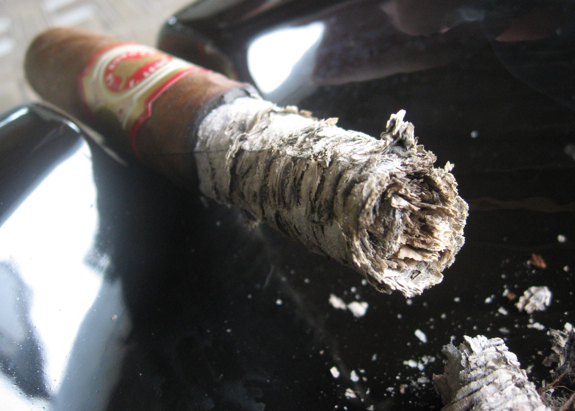 That cigar is simply called “La Aurora” but a lot of people seem to call it the La Aurora Cameroon so it’s easier to differentiate. 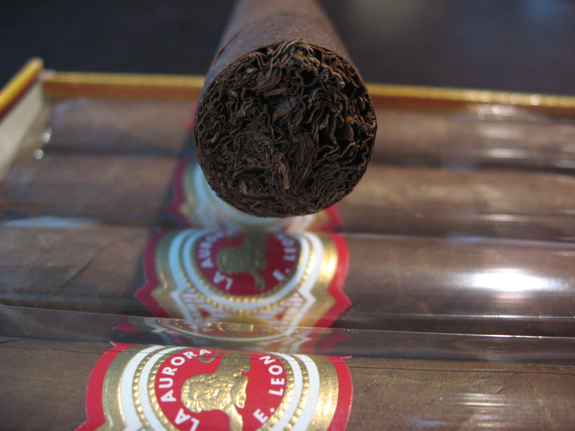 The Cameroon addition to the common name comes from the wrapper used to hold this cigar together. The majority of the leaf used in this cigar is harvested from the El Cibao Valley in Dominican Republic, the hometown country of the La Aurora factory. 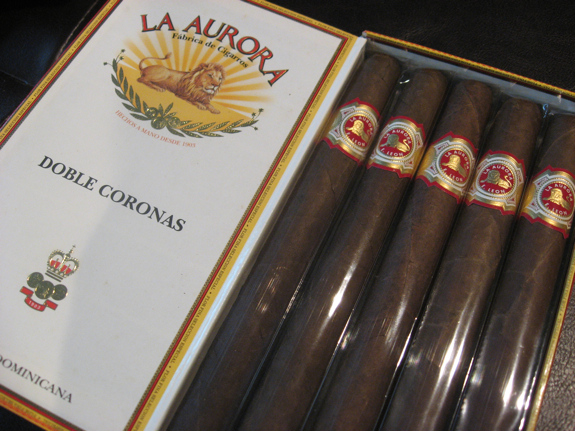 The La Aurora Cameroon is available in a variety of boxes not typically seen in other blends. You can actually pick these up in full presentation boxes of 5, 10, 20 and 25 cigars. As you can see from the pictures, I managed to get myself a 5 pack box of the Doble Coronas. •	Approaching the halfway mark, the sweet coffee notes are becoming more prominent and I’m getting some raw cinnamon notes in there too, the earthy and woodsy flavors are still there but are more in the backseat now. •	The finish at this point has turned super creamy as well, a very tasty touch! Let me start by saying I was very impressed by the overall construction of this cigar. 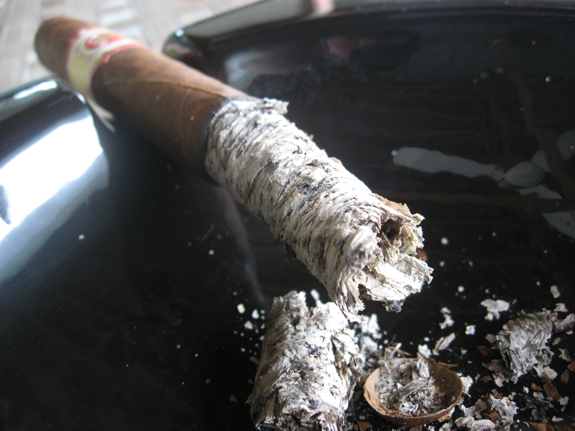 I always tend to have burn or draw issues when it comes to very large vitolas, especially ones that are well priced. 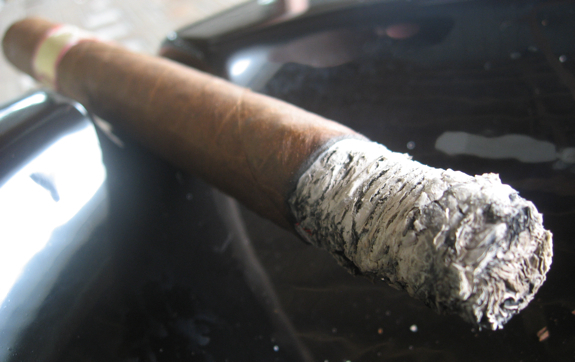 This cigar hit those marks with flying colors offering a perfect draw and great burn. The flavors were also extremely enjoyable and offered a bit of dimensionality to keep it interesting. 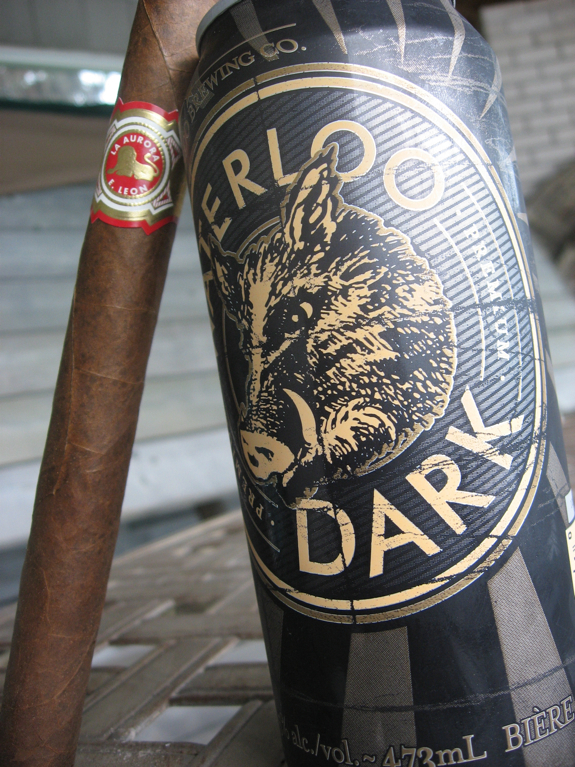 This cigar is still larger than what I would normally smoke and I think it would be even better in a smaller vitola. I also found through some searching that these are commonly offered as “Factory Seconds” at some retailers with this huge vitola selling for under $2! That’s just crazy good! Even the normal retail of this massive vitola is under $4, that’s a hard price to ignore for such a good cigar. These will definitely be part of my regular rotation at this price and I would highly recommend you seek them out. For today’s I went with a trusty brew that I always have on hand. It’s from Waterloo Breweries located only about an hour from my house and it’s their Dark Ale offering. Their Dark Ale is surprisingly light and refreshing but offers the great notes of roasted hops and a slight bitterness mixed with a mild fruity and malty flavor. 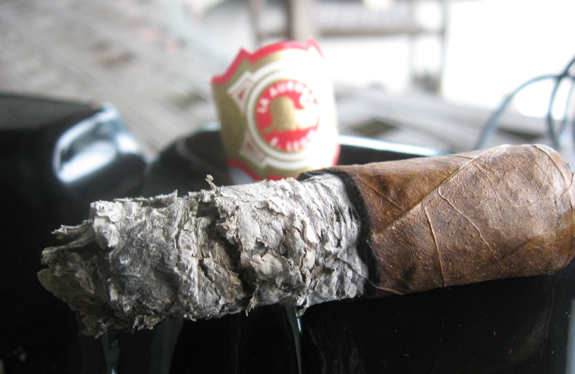 The La Aurora Cameroon is a fairly mild stick so this brew fit it well with it’s crispness. The bitterness and mild fruits paired excellently and accented to roasted and sweet notes of the cigar. I think an IPA or Amber lager would also pair well here. 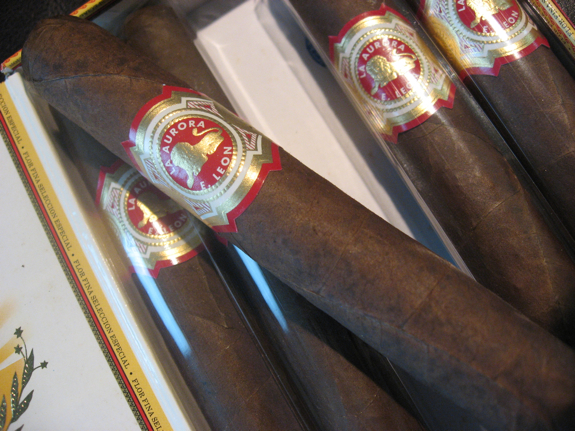 The flavors of the cigar could also compliment a nice coffee. I was impressed with the draw on this cigar and the amount of smoke each draw produced. The flavors just got better and better as the smoke progressed too! Good review. Never smoked this specific La Aurora specimen. Vitola is way too large and not something that I would normally buy. I need to look for some coronas and smoke couple. Thanks ! Great review, Daniel. I’ve looked past these, because I assumed they would just be a pedestrian smoke. Just goes to show that I need to try things before passing judgement. Dammit! Now I’m going to have to try these out, at least in a smaller size. Good thing CI has them at closeout pricing. Looks like another one to add to the morning rotation. 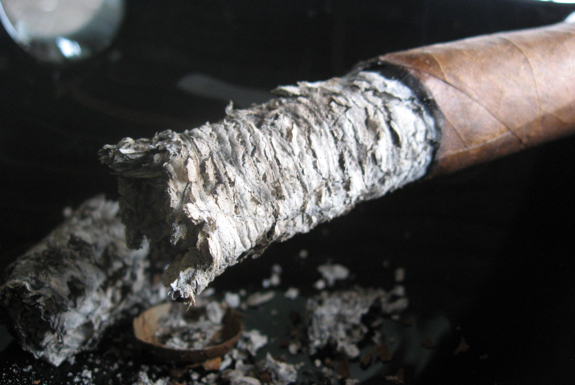 @Cigar Inspector – Agree completely there, and you just can’t go wrong at these prices. @Jay – Thanks bud! These are definitely overlooked since they came out long before La Aurora picked up all the steam and popularity it now has. Check em out and let me know what you think! @jjo – Thanks! I overlooked them quite a few times as well but not anymore. Definitely an underrated stick. The price CI has on these is insane! Grab a few and let me know how they smoke! OK, Daniel. I’m going for the 2nds in the corona size (5.2″ X 43). $17.95 for a bundle of 15, and free shipping. No more excuses at that price. Thanks for the tip! Sorry for the delay in updating you on this, but I wanted to be sure that I gave these a fair shake. 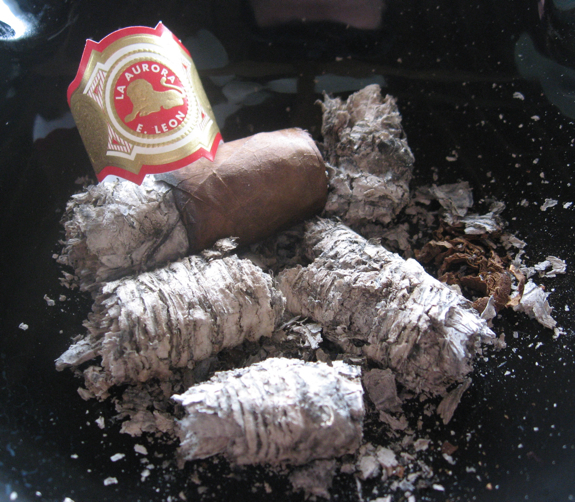 I got the 2nds about 3-1/2 weeks ago, and tried one after a couple of days in the humidor. I haven’t had the regular Cameroons, but I would venture to guess that the 2nds do not get the same TLC and aging. That first one seemed a little green and harsh and the draw tightened up about half-way through. I’m now on the fifth one 3 weeks later, and what a difference the extra time in the humidor makes! Much smoother, the sweetness comes out more readily, and the draw with a punch cut – this is the corona size vitola – is great. I haven’t picked up on very much of the sweet coffee flavors that you did, but maybe the difference in size (or my admittedly jaded taste buds) would account for that. Funny thing is that it seems to go better with a light ale than coffee, although I haven’t tried that for a couple of weeks. Would I buy more? Hell, yes. I’d just be sure to put them away for at least a month or so before smoking them. Thanks again for the heads up on these. You guys do a great service for all of us out here! Sounds like you found yourself a tasty smoke at a super low price point! These are getting harder and harder to find lately so I’m glad I was able to help! Enjoy the rest of the box Jeff!